Aaira Goswami, a 12-year-old girl rues the ignorance we have as a country about the rich history of the North-East. Can you name the Seven Sisters without looking it up on Google? Do you know what or who the Seven Sisters are? If you do, join us in commiserating the marginalisation of the North-East by the mainstream in India- be it in popular culture, media, or even education. As students, we have been taught nothing more than the names of the North Eastern states, and their capitals which we memorised laboriously. People from these states have been targets of stereotyping and even racial violence in a country which, ironically, prides itself on its diversity. 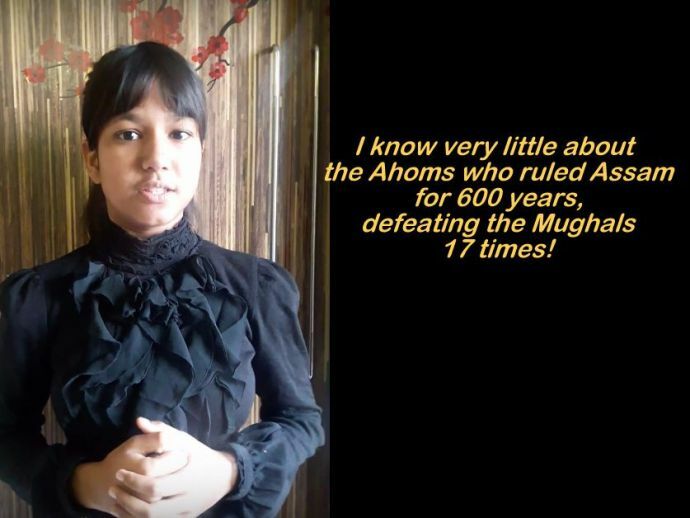 Aaira Goswami, a 12-year-old Assamese girl from Jaipur has exposed the utter apathy we have exhibited towards this part of India, in this video. Composed and yet hard-hitting, her monologue is a fervent appeal to PM Narendra Modi to include the rich, yet unknown history of Assam and other states in the school curriculum. It is indeed a sorry state of affairs when our schoolchildren are drilled with facts about World Wars and revolutions originating in faraway continents while remaining oblivious about their own home. Are the policymakers listening?